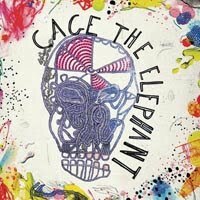 New York, NY- Cage The Elephant tops the charts with “Back Against the Wall” which claims the No. 1 position on Billboard’s Alternative Songs chart this week. This is no small feat for the Bowling Green, KY based band that has sold over 250K records since their self-titled debut less than one year ago. The success of the current single follows the band’s gold-certified single “Ain’t No Rest For The Wicked” which peaked at #3 on the Alternative Songs chart selling over 620K digital downloads. Cage The Elephant’s current headlining tour includes two New York area sold-out shows, the Bowery Ballroom on March 2nd and the Music Hall of Williamsburg on March 4th. Cage The Elephant burst on the national music stage in 2007, building a solid following and earning critical attention with their riveting performances in the U.K. and the U.S. at Coachella, Lollapalooza and All Points West. Cage The Elephant is comprised of brothers Matt (vocals) and Brad Shultz (guitar), Daniel Tichenor (bass), Lincoln Parish (guitar) and Jared Champion (drums).